Chlorination of water is one of the worldwide-accepted method of disinfection and purification of water to make it potable. For inexpensive, economical and timely purification of drinking water, under the various schemes of protected water supply in rural areas, Chlorine Tablets are highly effective. This is the easiest method of disinfection and purification of water. Chlorine provides a strong residual in the distribution system. Chlorine is easy to apply. Chlorine is a relatively inexpensive disinfecting agent. Chlorine is effective at low concentrations. It is used for disinfecting of Drinking water, Industrial residue and Pool cleaning. Due to its decolorizing property it is used in whitening of vegetable fibers like cotton, linen etc. and of paper pulp. Chlorine can be easily converted to chloramines that also provide a strong residual and do not produce by-products. It is used for disinfection of portable drinking water. It is used for disinfecting of Industrial residue and Pool cleaning. 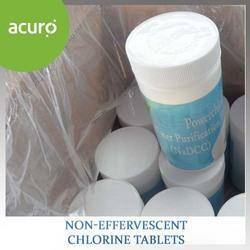 Chlorine non-effervescent tablets are manufactured using dry chlorine: The tablets are formulated for accurate treatment of water. These Tablets are available in different strengths for treatment of Water from 1 liter to 100000 liters of water. As a kind of disinfectant, it can sterilize drinking water, swimming pool, tableware and air, fight against infectious diseases as routine disinfection, preventive disinfection and environmental sterilization in different places, act as disinfectant in raising silkworm, livestock, poultry and fish, and also can be used to prevent wool from shrinkage, bleach the textile and clean the industrial circulating water. 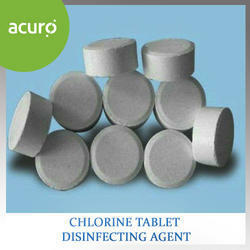 Looking for Chlorine Tablets ?